LISTED BELOW ARE A FEW OF THE MAIN SKILLS GYMNASTS MUST LEARN BEFORE MOVING TO THE NEXT LEVEL. Especially with our younger gymnasts, we try to keep kids in an age appropriate class regardless of skill level. Our goal is to have small teacher to student ratios so that we may push each child at their own level. If you have never been to Gymcats, your trial class will help us determine which level your child should start in. Preschool Program (girls and boys- walking to 7) — Our preschool program has carefully designed classes to provide children with the motor skills and concepts they need during these formative years. Gymcats kids acquire healthy learning attitudes through fun. Kids need to associate new challenges with learning and fun. Our program is designed to teach preschoolers different motor activities and concepts giving them the building blocks for future physical development. MOM AND ME: 18 mos – 3 year old (45 min. classes) — This class teaches toddlers everything to give them a jump in life– gross and fine motor learning skills, coordination, and of course interactive play. This class involves parent participation and encouragement. This is a great opportunity to bond with your child and give them special one on one time. CUBS: 3 – 4 year old (45 min. classes) — This class teaches beginning gymnastics skills on multiple apparatus, basic coordination, listening skills and of course turn taking. SUPERCUBS: 4 1/2 – 5 1/2 year old (1 hour classes) — This class increases coordination and builds a foundation of basic skills needed in order to move on in gymnastics. This class is taught at a similar level as our Developmental/Red Girls classes, but in an age appropriate manner. Developmental Program (girls and boys- 6 & up) — Our developmental program is second to none. Along with developing a passion for learning, Gymcats kids also learn to overcome obstacles. Through steps and progressions, coaches and kids will decide on small, reachable goals and keep a longer term goal to strive for. Basic techniques are taught and perfected at an early age. We send home report cards every other month so you and your child can keep track of their progress. Developmental Girls: (1 hour classes) Ages 6 & up — This class is specifically for girls that have not learned to attempt a cartwheel or handstand by themselves. It is also ideal for children that are timid or nervous to jump in with kids that seem to “already know what they are doing.” They will learn names of skills and the very basic skills on each apparatus (with a lot of focus on handstands and cartwheels), so that they may move into the beginning level pink class successfully. Pink/Red Girls: (1 hour classes) Ages 6 & up — These classes teach the fundamentals of gymnastics on all 4 of the girls events, including vault, bars, beam, floor and also trampoline. Intermediate level girls will be put in the “Red” level classes. Preteam 1 & 2: (1.5 hour classes) Ages 6 & up — This class teaches more advanced gymnastics on all 4 of the girls events, including vault, bars, beam, floor and also trampoline. These kids are given the option to compete when they progress to Level 4, but are never required. Developmental/Intermediate Boys: (1 hour classes) Ages 6 & up — This class teaches the fundamentals of gymnastics on all 6 of the boys events, including vault, high bar, rings, parallel bars, pommel horse, floor and also trampoline. Tumbling (1 hour classes) Ages 6 & up — The tumbling classes focus on just the Floor Exercise event in gymnastics. Although most participants are learning the tumbling for cheerleading or dance, the class is designed for anyone interested in learning tumbling skills (mainly round-off back-handsprings). Must be able to perform a handstand and cartwheel independently. 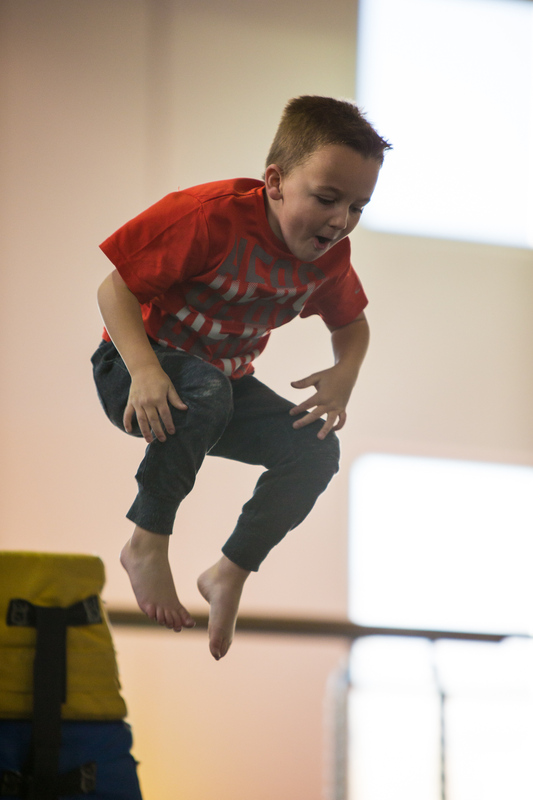 Intermediate Tumbling (1 hour classes) Ages 7 & up — This tumbling is for kids that have completed a session of tumbling and can do their back-handsprings by themselves on the squishy mat or cheese. Advanced Tumbling (Round-off, Back-handspring Required) — This class teaches advanced tumbling skills including tucks, layouts, fulls, and beyond.